Ladan Mohammad-Zadeh, DVM, DACVECC, lists some common blood transfusion myths, then explains the true or false reasons for these myths. Packed RBCs must be diluted with saline prior to administration. This could actually be true or false depending on how the unit was processed. Prior to the addition of a preservative in packed RBC units, the PCV of a unit could easily be over 70%. Blood with a PCV over 70% is hyperviscous and could be detrimental when administered quickly, especially to a hypovolemic or dehydrated patient. However, the additional volume of the preservative dilutes out the unit so the final product is safe to administer as is. If you are in doubt, you can easily check the PCV of the unit prior to administration. Pregnancy in canines makes them ineligible to be blood donors. Prevalence of alloantibodies in multiparous dogs is the same as nulliparous dogs, meaning there is no increased risk of a recipient experiencing a transfusion reaction when receiving blood from a multiparous dog. Cats do not need to be blood typed prior to transfusion. Similar to humans, cats do have naturally occurring antibodies, and in the event that a type B cat is given type A blood, it could prove fatal. Although the majority of American Domestic Shorthair cats are Type A, the prevalence of Type B cats is not as rare as it used to be. With the recent discovery of another blood antigen, Mik, it is clear we have not learned all there is to know about feline blood types. Some recommend cross matching even with the first blood transfusion in a cat. 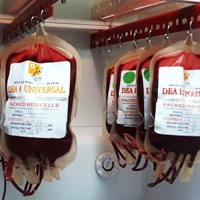 Cross match is necessary if a blood product is given more than three days from the previous transfusion. It takes about 3–4 days to develop antibodies against RBC antigens. Thus, a unit from a donor that may have been compatible for the first transfusion may no longer be compatible after three days. A Hemonate ™ filter should be used to reduce the possibility of bacterial contamination. A standard Hemonate ™ filter pore size is 18 micrometers. The average size of a bacterial particle is 1 micrometer. Thus, the primary reason for using any filter, Hemonate ™ or Y–filter (170 microns), is to prevent large particulates (cellular or protein aggregates) from entering the blood stream. A Hemonate ™ filter can only be used to filter volumes up to 60ml. Fresh Whole Blood* (20 ml/kg): Acute whole blood loss, thrombocytopenia. 1. Callan et al., Canine platelet transfusions. 2009. JVECCS. 19:401–415. 2. Blais et al., Canine dal blood type: A red cell antigen lacking in some dalmations.2001. JVIM. 21:281–286. 3. Blais et al. Lack of evidence of pregnancy–induced alloantibodies in dogs. 2009. JVIM. 23:462–465. 5. Small Animal Critical Care Medicine. Silverstein & Hopper ed., Saunders. St. Louis, MO. 2009. 6. Veterinary Hematology. Feldman BF ed. Fifth edition. Lippincott Williams, Baltimore, MD. 2000. 7. Weinstein et al., A newly recognized blood group in domestic short hair cats: The mik red cell antigen. 2009. JVIM. 21:287–292. I've heard varying opinions on the blood filter sets when giving a packed cell transfusion. Does the blood need to completely cover the filter or does it matter? I've heard that the blood dripping onto the top of the filter can cause unnecessary cell damage. Is there any truth to this? Jessie, I have always tried to fill the filter at least halfway with blood but I don't think it matters all that much. I am not aware of any studies regarding cell damage due to dropping onto the filter (anyone out there have anything to add? Feel free! ), I treat it like a IV fluids drip chamber-fill halfway and go! "A Hemonate filter can only be used to filter volumes up to 60ml." .. Does this mean we should be changing out the filter every 60 mL of blood transfused during a transfusion? Sarah, if you are using a Hemonate filter for volumes greater than 60 ml, you should be changing the filter out. For volumes greater than 60 ml, a typical Y-Type filter set is usually recommended so you don't have to worry about stopping the transfusion and replacing the filter. Hemonate filters are also very small in pore size, about 18 micrometers as opposed to the Y-type which is over 200 micrometers. This means it is easier to deliver the product faster without alarming pumps using a Y-type filter. And remember you're not using the filter to filter out bacterial particles, just larger clots or white cell aggregates which a 200 micron filter easily catches. Hope that helps! "Pregnancy in canines makes them ineligible to be blood donors. FALSE. Prevalence of alloantibodies in multiparous dogs is the same as nulliparous dogs, meaning there is no increased risk of a recipient experiencing a transfusion reaction when receiving blood from a multiparous dog." Is there another reason previously bred female dogs would be disqualified from a practice's blood donor program? Hi Sasha. 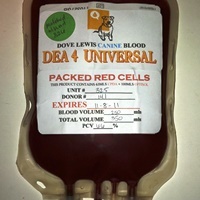 To answer your question about if there is another reason why a blood bank would not accept blood from a dog that been previously bred, the issue of alloantibodies was the main reason. Transmissible venereal diseases are very uncommon in dogs but Brucella is among the infectious diseases that gets screened for prior to donation. And even if a patient has Brucella it is unlikely the recipient will become sick. But on the human side of things, they either decline blood from a person who has Brucella antibodies or they wait for TWO YEARS after the infection has been cleared. So I would take my cue from them. I may be missing another reason, but that's what I can think of for now! Thanks for the question! I have read that dog RBCs transfused through a hemonate filter don't survive long. I have also read that this is not true of cat RBCs. Hi David! Thanks for bringing up these studies. The newer one came out after this original post and we are constantly learning more about the best transfusion practices. I am very intrigued by these findings, although it makes sense. Dog RBCs are bigger than cats and given the (generally) higher rates of delivery, it seems reasonable that dog RBCs might not stand up to passage through a Hemonate filter compared to cat RBCs. 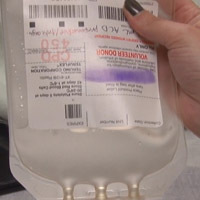 Despite the results in the 2011 canine study, some people are still delivering blood via conventional fluid pump because of the convenience of delivery and less risk of giving the blood too fast or slow. Despite the evidence that running canine RBCs through a convention fluid pump does decrease survival, clinically we often see the expected increase in PCV in the transfusion recipient. Of course we have times where the PCV doesn't go up as expected, especially in IMHA patients. I would love to see a similar study to the one in 2011 using IMHA dogs as the study population. Great comments! Thanks for reading the article!